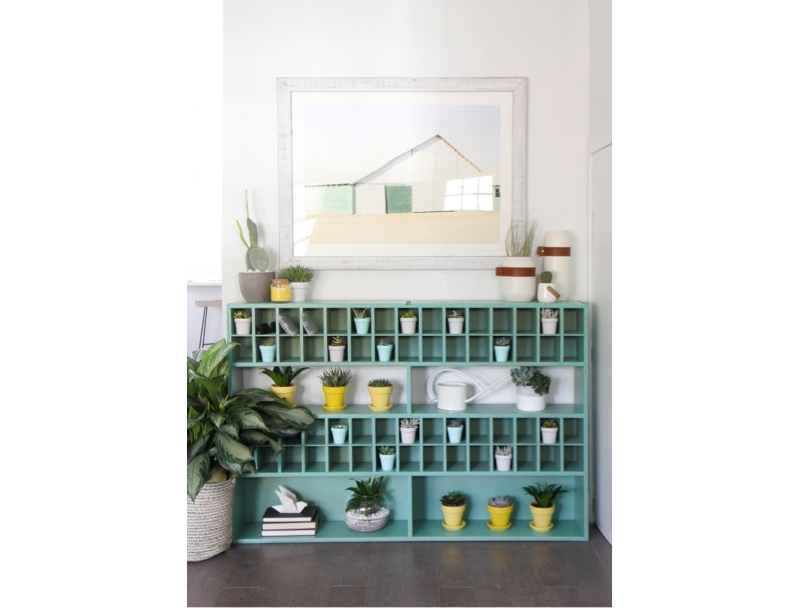 Create an eye-catching succulent storage for your entryway using Krylon®! Wipe down the surface of the shelf, ensuring that the shelf is free of any dust or debris. In a well ventilated area, spray the shelf using Krylon® ColorMaster™ Paint + Primer - 25% More in Satin Jade. Please be sure to follow the safety and application instructions located on the can for optimal results. Allow time for shelf to dry completely. Sand the edges and corners of the shelf using the 220 grit sandpaper to create a vintage appearance. Spray the terracotta pots using Krylon® ColorMaster™ Paint + Primer - 25% More in Gloss Sun Yellow, Gloss Bright Idea, and Matte Aqua. Once pots have dried, begin to plant the terracotta plants. Decorate your entryway piece and enjoy!